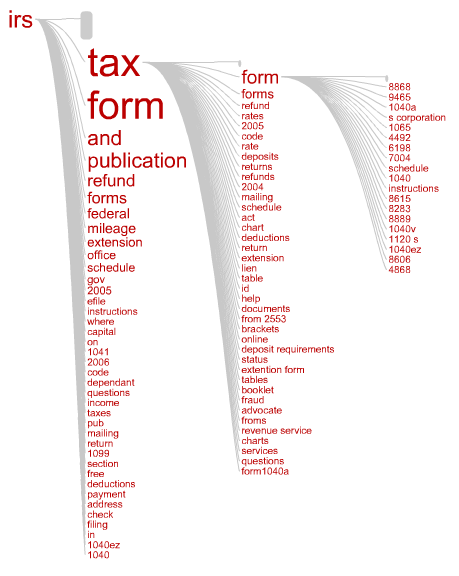 This "query tree" shows the most frequent searches starting with the term "irs". Each branch in the tree represents a query where the words are sized according to frequency of occurrence. I like how you can see at a glance what the most popular tax forms are by following the "irs tax form ..." branch. Apparently form 8868, Application for Extension of Time To File, is in high demand. It was created by uploading search queries from AOL users leading to clicks on irs.gov during Spring 2006 to Concentrate, which generated the query tree. This image is a snapshot of an interactive flash visualization in Concentrate, where the focus term was "irs". Looking at query patterns like this can help you get an idea of what people are looking for and how to better organize your site so they can find it quickly. The interactive flash visualization was developed by Chris Gemignani using Flare with some input from Zach Gemignani and myself and inspiration from the Many Eyes WordTree.